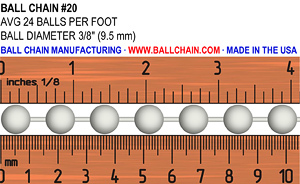 This chain is commonly used industrial applications. Also used for ShimmerScreen. 3/8" 9.5 mm 24 120 lbs. 175 lbs. CHECK 150 lbs.